I have always been a supporter of underdogs. In fact, I consider myself an underdog. That's why when Russell Wilson was taken in the 3rd round (the 3rd round!) of the 2012 NFL Draft, he had my support. Granted, this draft class consisted of highly touted Andrew Luck and Robert Griffin III, but Wilson is considered an undersized quarterback (5'11"). Not too many people would have guessed that he of all the quarterbacks taken in that draft, would be the first one to win a Super Bowl, let alone in only his second year in the league. Wilson's rookie season came as a surprise to many people when the Seahawks started winning consistently. In fact, the Seahawks went unbeaten in Seattle for 14 games - losing only once at home in Wilson's young career. When the playoffs came around last year, they went to Washington and defeated the Redskins. Then on January 13, 2013, they played the Atlanta Falcons in the NFC divisional game. I remembered listening to this game on the radio as I drove to Orange County to meet with a client, and Seattle was getting beat pretty badly. Once the meeting was over, I flipped on the radio in the car and the Seahawks were in the midst of a fourth-quarter comeback that would have sent them on to the NFC championship game for the right to play in the Super Bowl. Unfortunately, they lost by 2 on a field goal, but in my head, they had literally won that game. I think it was that particular game that convinced me that they were going to be back, and better next year. Flash forward just 6 days later, and I'm in the studio photographing the Vince Lombardi trophy for the NFL. This was turned into a special video of Kurt Warner, Marshall Faulk, Michael Irvin, and Warren Sapp reliving their Super Bowl memories. 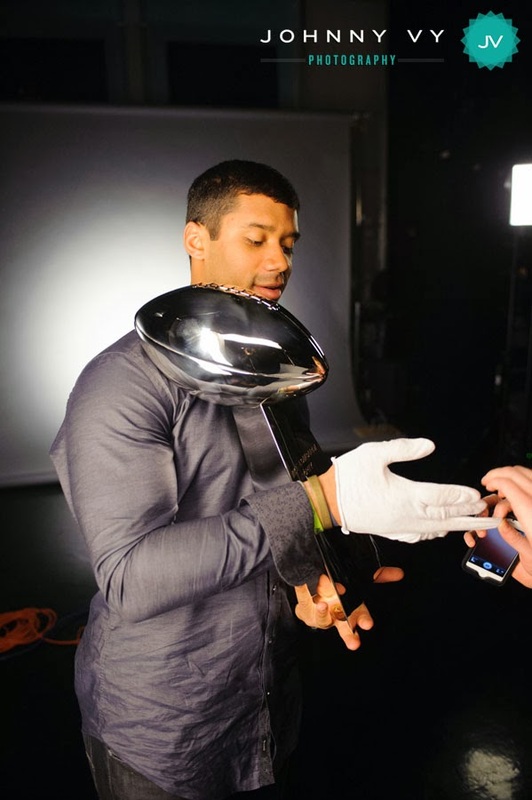 As I'm photographing the trophy, Russell Wilson walked in. Is he really as "undersized" as people say? For a quarterback? Yes. I am 5'10", and I looked at him eye to eye as I shook his hand. It actually inspired me and made me believe that I could be a football player in another life. It really is quite remarkable how guys like Drew Brees and Wilson could go up to the line of scrimmage, with these huge guys frothing at the mouth on the other side (the scene from "Little Giants" comes to mind, for whatever reason), and remain cool, calm, and collected. I was slightly confused about the sudden appearance at the time, because in my head, he was supposed to be preparing for the NFC championship game that week. I was obviously mistaken, but honestly it didn't occur to me until after he left the building that they had already been eliminated from the playoffs. I think they played so well against Atlanta in the fourth quarter that I just had them moving onto the next round. I asked him to hold the trophy, and he was a little hesitant at first. I think it was like one of those times where you get to touch the Stanley Cup, or something, and set off a jinx that you'll never win it. The Lombardi handlers generally make people put on gloves while handling it, but I had him remove the gloves for the picture. I think they were willing to make an exception in this case! I want to believe that the moment he held the trophy, the focus for next year had already begun. Keep in mind that this was only 6 days after being eliminated from the playoffs. The look he had on his face wasn't so much of desire, but it was of hope and determination. He held it delicately like it was a baby, and it did feel as if he felt undeserving of being in its presence, let alone holding it for about a minute. You never really think that the first time you get to hold the Lombardi Trophy would be after being eliminated, but instead, after a crowning achievement like the Super Bowl. I didn't care (sorry, Russ). I wanted the photo, and when opportunity knocks, you gotta take it. I just knew that one day, he was going to take this team on his back and lead them to the Super Bowl. I have shot various portraits for the NFL over the past two years. You can see more of my NFL portraits, among others, here and here. 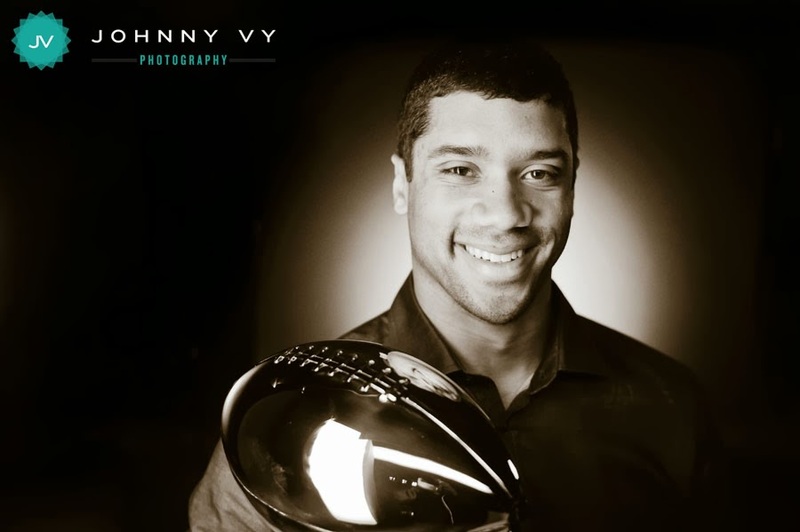 So when Russell Wilson walked in, I never thought to have a portrait of him taken without the trophy. Had I thought of that, I would have posted a portrait of him a year ago. Instead, I buried this portrait in the archives, hoping one day for a Super Bowl victory in Seattle, so that I could finally make use of this picture. Seriously, who wants a picture of a player with a trophy that he has not yet won? Part of the reason I never showed it to the public was because I didn't want to jinx it. Can you imagine the locker room bulletin board material for opposing teams? The other reason is that it just wasn't relevant. So I kicked myself for a few weeks thinking to myself, "why the heck didn't I ask him to put down the trophy and just take a normal portrait of him?" When Super Bowl XLVII was won by the Baltimore Ravens, the offseason began in the NFL. Over the summer, I photographed various projects for the NFL, particularly of players working out and preparing for next season. 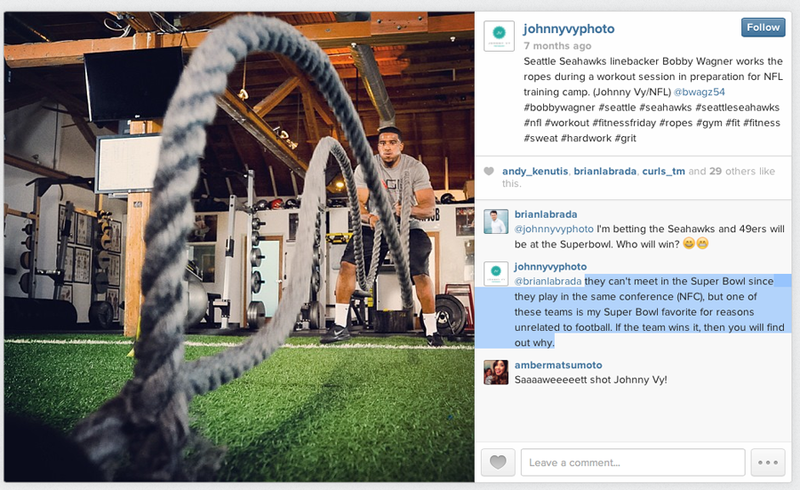 I met Seahawks linebacker Bobby Wagner during one of the workouts, and told him that I was going to visit Seattle in a few days as a vacation with my wife. He gave me the lowdown on the places to go visit, and his favorite places to eat. I discovered that he was from the same area my wife grew up, actually had a nice conversation about the Inland Empire with him. Those of you familiar to Southern California will know what a rarity that is when it comes to the I.E. 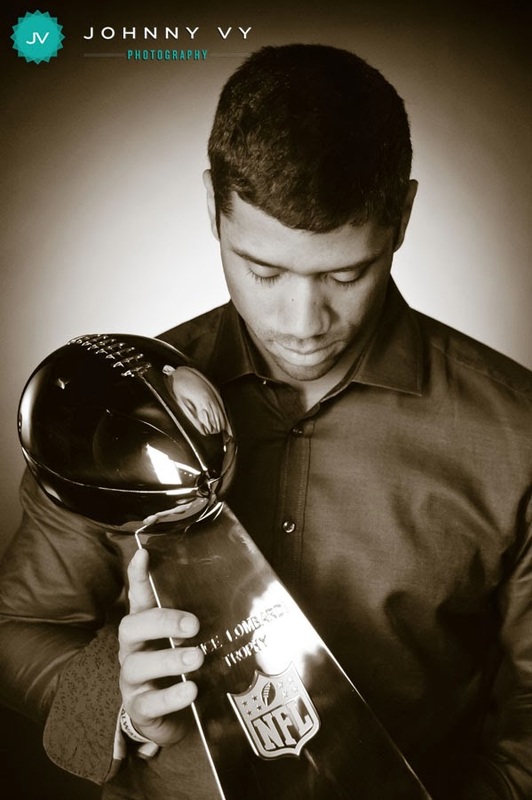 Well now that the Seahawks have won the Super Bowl, I finally got a chance to post the image of Russell Wilson with the trophy. That was my reason for my Super Bowl pick. In hindsight, I really should have put some money down on that pick, but I have never been a gambling man anyway. 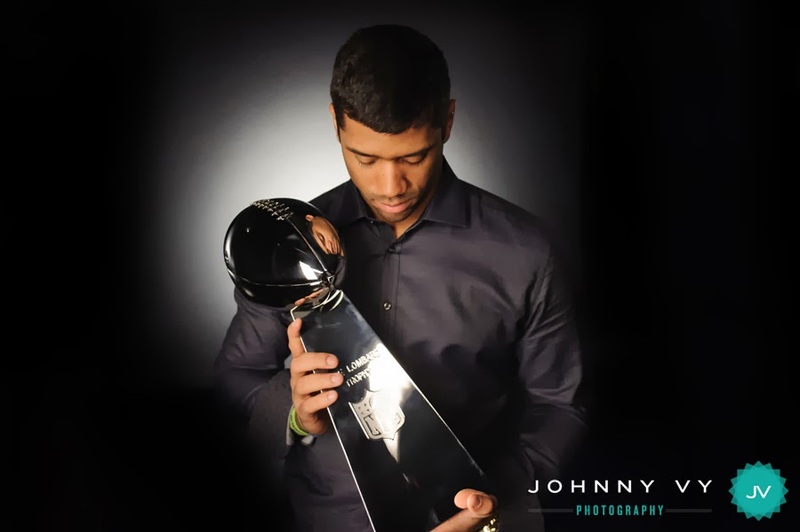 So once the shoot ended, I began a year-long fixation of why I never asked him to put down the trophy for a "normal" portrait with one of the rising stars of the NFL. As the Seahawks started rolling through the season and into the playoffs, I found my wife getting just as excited as I was for their success (she says she roots for Richard Sherman because he's from Compton). People in football, or sports in general, know how difficult it can be to even get to the Super Bowl, let alone win it all. I just had a feeling when he walked in that day that he was going to reach that pinnacle one day. A big congrats to the city of Seattle, and of course to the Seahawks, Russell Wilson, and Bobby Wagner. I have come to love the city, and meeting the two of these guys makes me continue to root for all the underdogs of the world. They won this thing with the fourth-youngest roster in Super Bowl history, along with a group of undervalued late draft picks that they have developed into Pro Bowl players (kudos to Pete Carroll too). 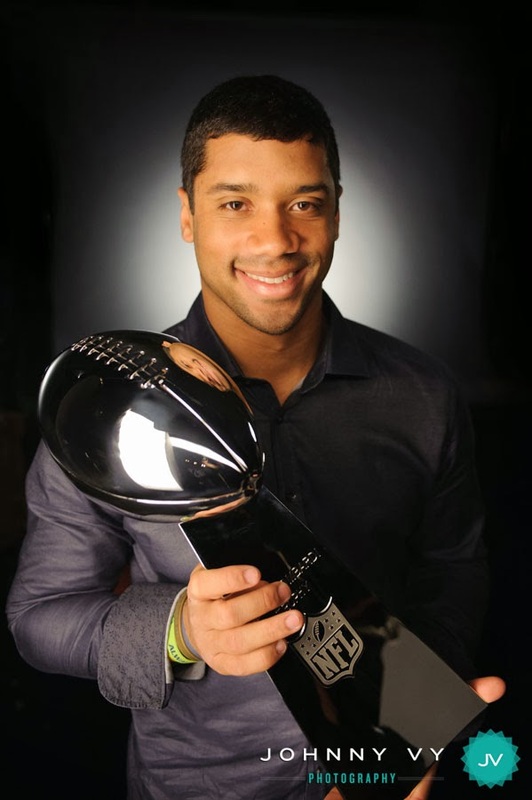 Seattle deserves this one, and it was great to see Russell Wilson hoist that Lombardi Trophy last night with conviction. He earned it. Hear the sounds of the celebration on NFL.com's Super Bowl XLVIII Sound FX. (Check out Wilson's comments at the 4:09 mark of the video, about a talk he had with Coach Carroll on the team bus after their loss to the Falcons). The most epic way to take a selfie? Having a reflection of yourself in the Vince Lombardi Trophy.